Nationality: British. Born: Richard Samuel Attenborough, Cambridge, England, 29 August 1923; full title, Lord Attenborough, Baron of Richmond upon Thames (from 1993). Education: Wyggeston Grammar School for Boys, Leicester, England; Royal Academy of Dramatic Arts (RADA) on Leverhulme Scholarship, until 1941. Military Service: Royal Airforce; served in RAF Film Unit, 1944–46. Family: Married Sheila Sim (actress), 1945, son: Michael, daughters: Jane and Charlotte; younger brother is David Attenborough, British TV executive and naturalist. Career: Film acting debut in In Which We Serve , 1942; co-starred with wife Sheila Sim in original stage production of The Mousetrap , 1952; chairman, 1956–88, and president, from 1988, Actor's Charitable Trust; debut as film producer, 1961; chairman of Combined Theatrical Charities Appeals Council, 1964–88; member of Cinematograph Films Council (UK), 1967–73; directorial film debut, Oh! What a Lovely War , 1969; director of Chelsea Football Club (London), 1969–82; chairman of RADA from 1971; chairman of Capital Radio (UK), 1972–92; chairman of Duke of York's Theatre (London, UK), 1979–92; chairman of Goldcrest Films and Television Ltd., 1982–87; president of The Gandhi Foundation, from 1983; member of Committee of Inquiry into the Arts and Disabled People (UK government post), 1983–85; fellow, from 1983, and vice president, 1971–94, BAFTA; president of Brighton Festival (UK), from 1984; president of British Film Year, 1984–86; member of British Screen Advisory Council, from 1987; Goodwill Ambassador for UNICEF from 1987; member of European Script Fund, from 1988; head of Channel Four Television (UK), 1987–92; fellow of BFI, from 1992; fellow of FKC, from 1993. Awards: Zulueta Prize for Best Actor, San Sebastián International Film Festival (Spain), for The League of Gentlemen (shared with Jack Hawkins, Bryan Forbes, Roger Livesey, Nigel Patrick), 1960; British Academy of Film and Television Arts (BAFTA) Award for Best British Actor, for Guns at Batasi , 1965; San Sebastián International Film Festival Prize for Best Actor, for Séance on a Wet Afternoon , 1964; Golden Globe for Best Supporting Actor, for The Sand Pebbles , 1967; received CBE, 1967; Golden Globe for Best Supporting Actor, for Doctor Dolittle , 1968; knighted, 1976; Oscars for Best Director and Best Picture, BAFTA Film Awards for Best Direction and Best Film, and Directors' Guild of America Award for Outstanding Directorial Achievement in Motion Pictures (with David Tomblin, assistant director), all for Gandhi , 1983; Evening Standard Film Award for 40 Years' Service to British Cinema, 1983; Berlin International Film Festival Peace Film Award Honourable Mention, for Cry Freedom , 1988; BAFTA Alexander Korda Award for Best British Film, for Shadowlands , 1994. Address: Old Friars, Richmond Green, Surrey, TW9 1NQ, UK. In Search of Gandhi , London, 1982. Richard Attenborough's Chorus Line , London, 1986. Cry Freedom: A Pictorial Record , London, 1987. Castell, David, Richard Attenborough: A Pictorial Film Biography , New York, 1984. Woods, Donald, Filming with Attenborough , New York, 1987. Robinson, David, Richard Attenborough , London, 1992. Dougan, Andy, The Actors' Director: Richard Attenborough behind the Camera , with an introduction by Steven Spielberg, Edinburgh, 1994. Robinson, Stephen, "The Liberal Friendship That Wasn't," in Spectator (London), 19 September 1987. Sampson Anthony, "Attenborough's Biko: The Political Implications of Cry Freedom ," in Sight and Sound (London), Winter 1987–1988. Dyer, Richard, "Feeling English," in Sight and Sound (London), March 1994. Sharma, Shaija, "Citizens of Empire: Revisionist History and the Social Imaginary in Gandhi ," in Velvet Light Trap (Austin, Texas), Spring 1995. Arnett, Robert, " Gandhi : A Screenplay Review," in Creative Screenwriting (Washington, D.C.), vol. 3, no. 4, 1996. Maland, Charles, "How Much Chaplin Appears in Chaplin ? A Look at Attenborough's Screen Biography," in Literature Film Quarterly (Salisbury, Maryland), vol. 25, no. 1, 1997. Richard Attenborough's successful film career as an actor had been established for twenty-seven years when he directed his first feature. Oh! What a Lovely War was an adaptation of Joan Littlewood's London stage show about the First World War and the waste of life caused by incompetent and careless strategists. 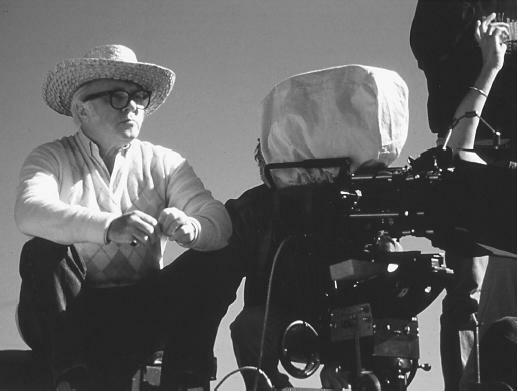 With a script by spy thriller writer Len Deighton, the film shows hints of Attenborough's future strengths as a director. In particular, the closing shot, in which the camera tracks backwards over a war cemetery, anticipates similar large-scale landscapes and crowd scenes in films such as Gandhi and Cry Freedom. Even the more intimate, and rather disappointing, Shadowlands contains some hallmark Attenborough footage as a small car winds its way through the English countryside. After completing his training at the Royal Academy of Dramatic Arts in London, Attenborough began his film career in 1942, playing the role of a frightened young sailor in Noel Coward's acclaimed war film, In Which We Serve. It was a part he would reprise in many British war films during the 1940s and 1950s: as a young actor during World War II, Attenborough made a name for himself representing the ordinary serviceman, struggling to do his duty in the face of overwhelming world events. It was only by taking on character roles such as Pinkie Brown in the 1947 adaptation of Graham Greene's novel, Brighton Rock , that Attenborough managed to avoid becoming type-cast. Yet the impact of those early roles in war films was to be felt in his work as a director: the underlying theme of his best-known film, Gandhi , is of an ordinary man caught up in major historical events yet rising to the challenge with honour, dignity, and self-sacrifice. Attenborough has claimed that it was always his ambition to make a film of the life of Mahatma Gandhi, and in 1982 Gandhi became his most successful effort as director to date. The film, which won a total of eight Oscars, runs to over three hours and gives a linear biographical account of the founder of modern India. The pace tends to be rather slow, but the Oscar-winning performance of Ben Kingsley in the title role is fascinating to watch, and the film successfully captures a sense both of the vastness of India and the difficulty of the struggle. The overall strength of the film as an uplifting story of courage and sacrifice makes it possible to overlook its simplistic historical vision. Chaplin was an attempt to repeat the epic life of a little man, but proved similarly questionable as an accurate biopic, and lacks emotional depth. Later films, such as Shadowlands , In Love and War , and Grey Owl are not of the same order as Gandhi , which managed to be both epic and touching. Attenborough has gained a reputation as a director of long films with epic themes, and his style tends to be technically, rather than emotionally, impressive. His third film as director, the war action film A Bridge Too Far , is a case in point: its all-star cast and ambitious scale tend to detract from the human tragedy of its subject matter, the allied defeat at Arnhem in 1944. A later film, Cry Freedom , has similar limitations. The story of journalist Donald Woods and his investigation of the death of Steve Biko in police custody in South Africa is a gripping thriller, but the film has been criticized for romanticizing the relationship between Woods and Biko. In the end its political impact is reduced by a rather detached mood, and moralizing tone. When Attenborough has attempted smaller-scale dramas, as in Shadowlands , the effect of such detachment is an awkwardness that goes beyond the psychological difficulties of the main characters. Telling the story of the love affair between writer and Oxford Don C.S. Lewis and the American poet Joy Davidson, who later turns out to be terminally ill, the film was named to Time magazine's top ten list in 1993. But the success of Shadowlands perhaps reflects the strength of the performances of Anthony Hopkins and Debra Winger in an otherwise sentimental film. Distinguished actors and young stars alike continue to be attracted to Attenborough's film projects, and he continues to appear in films as diverse as Steven Spielberg's Jurassic Park series and Kenneth Branagh's Hamlet. Although he has become better known as a director since the 1970s, it was his success as a character actor and as an important British star in the 1950s and 1960s that enabled him to co-produce and direct his first feature. Having come late to directing, Richard Attenborough, who received a life peerage and was made Lord Attenborough in 1993, has become one of the most important influences in British cinema. The fact that he has continued successfully to direct, produce and act in films since the late 1960s marks him out as a true all-rounder.